Chiroti is one of the delicacies of Karnataka. This Sweet dish is considered as royal dessert. This chirote or Padir Peni or penori is made during weddings. Traditionally this recipe calls for Chiroti Rave ( the name for this sooji/rave comes from this sweet) , now a days this is prepared using Maida / All Purpose flour. Chiroti as such it is not sweet by itself. 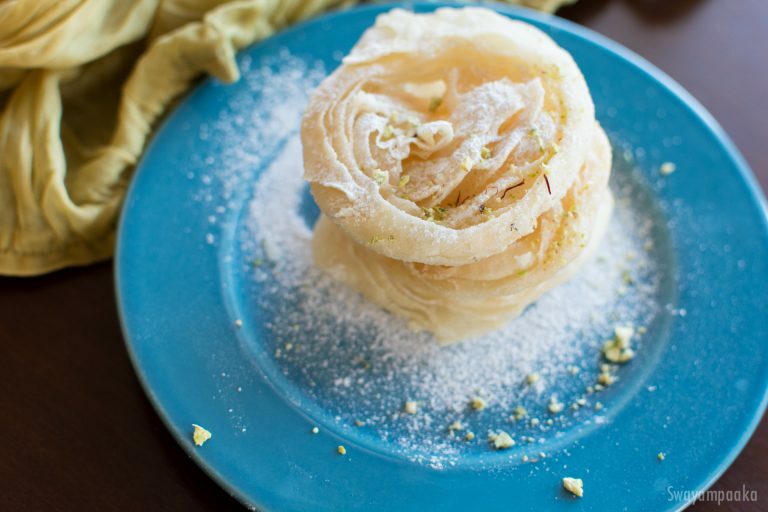 This flaky sweet served with Powdered Sugar and Saffron Badam Milk. My daughter like to eat crisp Chiroti with powdered Sugar. My son wants to add Badam Milk to this. However the way we want to eat Chiroti it is just mouthwatering, amazing sweet. For Badam Milk Mix CLICK HERE! Take the rave in a bowl. Add water little by little, mix it . Add water until you get the smooth firm dough. Knead it for 5 minutes. Smear little oil, cover the dough and keep it aside for 10 to 20 minutes. Take the ghee in bowl. Whisk it nicely until ghee becomes smooth and light. Add rice flour, again whisk it using your fingers to make soft, light, fluffy mixture. It is like whip cream frosting on cake. Keep it aside. After resting time, knead the dough again for a minute. Two ways you can roll this dough. Now roll these 5 piled up rotis to a tight long log. Divide this log into 12 parts. Heat the enough oil or ghee in a wok or pan medium low heat. Make few and keep it ready. Once the oil is hot enough, gently place this prepared chiroti into this hot oil. Using the ladle pour the hot oil in the center to get the layered chiroti and helps the chiroti to cook in layers. Flip it to other side and fry it. Once the bubbles are subsides, remove it from the oil and transfer it onto a paper towel. Repeat the same procedure with the remaining chirotis. Take a chiroti in a plate, sprinkle generously the powdered sugar on top of the Chiroti. Crush it, eat or prepare badam milk, pour it on top of this crushed sugar chiroti and eat. Thank you for the informative video. I will use this technique to make my frilly pattice. I searched all over the net but there was no video showing it the way you have shown it. Hope my pattice turn out the way they should. Thanks once again.